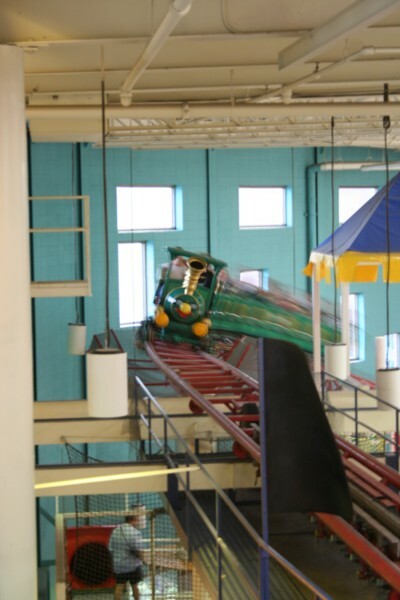 This is just a simple family indoor park, with few rides, but still quality rides. There is actually one roller coaster, which was manufactured (if i'm not mistaking) by Intamin... It's a kiddie coaster, but still more intense than your casual kiddie coaster. It goes through a tunnel during the first drop, it has light effects, overall I thought it was a decent kiddie coaster. Really worth the 3 dollars. There is a small frog hopper, but bigger than the kiddie ones (like a kiddie Double Shot tower)... There is a ferris wheel inside the mall which is pretty awesome, there is an ice rink in the middle of the park, it looks really great overall. I also think there is a swinging inverting ride, but I haven't seen it when I went there.